Synthroid is the most popular thyroid hormone replacement drug on the market. It contains levothyroxine, the more abundantly produced of the two thyroid hormones. Endocrinologists widely endorse Synthroid for the treatment of hypothyroidism but it does come with a number of serious side effects and limitations. Synthroid is a synthetic thyroid hormone replacement pill used in the treatment of hypothyroidism. It contains levothyroxine sodium and it is the most popular levothyroxine brand. Synthroid is available in 12 different dosage strengths ranging from 25 micrograms to 300 micrograms. Each strength comes as a differently colored pill and the varying strengths are manufactured to help doctors prescribe accurate dose combinations for their patients. The manufacturer recommends that Synthroid is taken on an empty stomach. Most doctors tell their patients to take the drug first thing in the morning and at least 30 – 60 minutes before breakfast. The absorption of Synthroid is at its optimal when taken this way. In addition, some other drugs, as well as supplements, may interfere with the absorption or effects of Synthroid. Therefore, other drugs should be avoided at least 4 hours before and after taking this thyroid medication. Drug interactions may occur when Synthroid is combined with antacids, blood thinners, drugs that lower cholesterol levels as well as calcium and iron medications. Although Synthroid improves thyroid functioning by supplying levothyroxine, it is not recommended for any off-label use including as an anti-obesity or weight loss drug. The dose required to increase metabolism and trigger weight loss is too high and may actually cause serious side effects. When taken in high doses, Synthroid may cause side effects such as tremors, rapid heartbeat, shortness of breath, nervousness, irritability, excessive sweating, fever, weight loss, diarrhea and heat sensitivity. All of these are presentations of hyperthyroidism. Prolonged use of high doses of Synthroid may affect the menstrual cycle, fertility, and bone density. Partial hair loss is a common side effect experienced by some users in the first few months after Synthroid therapy is started. However, this hair loss is temporary and reversed after the body develops tolerance to the drug. Synthroid should be avoided by patients who have had heart attacks, who have thyrotoxicosis (in which an overactive thyroid gland releases excessive amounts of thyroid hormones) or who have adrenal gland problems. In addition, patients are expected to tell their prescribing physicians if they suffer from anemia, coronary heart disease, diabetes, blood clot disorders and pituitary gland disorders. Pregnant and breastfeeding women also need to consult with their physicians before starting Synthroid. Synthroid does not cure hypothyroidism. Rather it replaces one of the hormones naturally produced by the thyroid gland. Therefore, people taking the drug will always need it even after their symptoms disappear. Levothyroxine is also known as levothyroxine or LT4. It is one of the two major thyroid hormones. The other major thyroid hormone is triiodothyronine or T3. This is the more active of the pair and the body can make T3 from T4. However, the thyroid gland produces 11 times more T4 as T3. The major medical use for levothyroxine is in the treatment of all forms of hypothyroidism. It is also used to prevent thyroid cancer from reappearing. Lastly, levothyroxine is used to treat goiter because it can reduce the amount of thyroid-stimulating hormone (TSH) released from the pituitary gland. TSH is the hormone that controls the release of T3 and T4 from the thyroid gland. When the level of the thyroid hormones in the body falls, the feedback mechanism controlling thyroid functioning increases the release of TSH which then stimulates the thyroid to produce more T3 and T4. However, goiter results when TSH increasingly stimulates the thyroid gland even though this stimulation does not lead to an increase in the production of T3 and T4. Therefore, by supplying levothyroxine, the body can cut back the production of TSH when it detects optimal levels of T4 and T3. 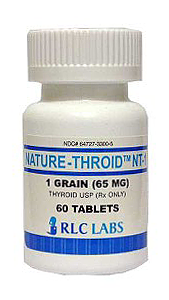 Levothyroxine only serves to replace the thyroid hormones that should be produced naturally in the body. This means that it does not stimulate the thyroid to produce more hormones. However, since levothyroxine supplies the body with thyroid hormones, it can cause long-term suppression of TSH. In the absence of the natural upregulation and downregulation of the TSH, the feedback mechanism regulating thyroid hormone levels may become inefficient with disuse. Prolonged suppression of TSH has been shown to affect the heart and also reduce bone density. Other side effects and contraindications for levothyroxine are the same as Synthroid. Besides Synthroid, other popular levothyroxine brands are Euthyrox, Thyrax, Thyrox, and Levoxyl. Although Synthroid is the most prescribed drug for hypothyroidism, it does not work for everyone. Much as endocrinologist want their hypothyroid patients on Synthroid, the drug is far from being the magic pill for hypothyroidism. Before discussing why natural alternatives to Synthroid are better, it is important to know the limitations of Synthroid. First, Synthroid contains only one of the two major thyroid hormones. For years, doctors have argued that only T4 or levothyroxine needs to be replaced because the body can convert some of it to T3 which is the more active hormone. Ideally, Synthroid should produce a better thyroid function profile. This means that it should normalize the levels of T3, T4, and TSH. Unfortunately, this is not always the case and even when this treatment goal is achieved, some hypothyroidism symptoms still persist. Curiously, such patients with persistent hypothyroid symptoms perform better when they are placed on thyroid replacement drugs that combine T4 and T3. Therefore, doctors may add a T3 drug such as Cytomel to Synthroid or move non-responsive patients to drugs such as Thyrolar that contain both thyroid hormones. This means that T4/T3 combination is a better treatment option than the single thyroid hormone found in Synthroid. However, even Cytomel and Thyrolar add to the cost of treatment. They both contain synthetic hormones and they both cost patients more than a natural Synthroid alternative will. The natural alternative to Synthroid and all other synthetic thyroid medications is desiccated thyroid. Desiccated thyroid is made from pork thyroid glands. This natural source of thyroid hormones has been used to treat hypothyroidism for over 100 years. It is effective, safe and well-tolerated. However, during the middle of the last century, doctors began to focus more on laboratory tests than the symptoms of patients. They believed that a better control of TSH levels should be the chief goal of hypothyroidism therapy. To meet this goal, levothyroxine and other synthetic thyroid hormones were introduced. With the marketing muscle of pharmaceutical companies and a total shift towards synthetic drugs in medicine, desiccated thyroid soon fell out of favor with doctors. One of the main arguments that endocrinologists put up against natural desiccated thyroid extract is that it does not allow for a tight control of TSH levels, that it supplies widely varying amounts of thyroid hormones. This criticism is true. But recent evidence has also shown that Synthroid also supplies varying doses of T4. In fact, the FDA (Food and Drug Administration) noted that the manufacturer sold low potency Synthroid between 1990 and 1992. In response to constant FDA complaints about the wide variations in the product, the manufacturer (Knoll Pharmaceuticals) changed the formula of Synthroid on numerous occasions. In 2001 when Abbot Labs bought Knoll Pharmaceuticals, the new manufacturer submitted yet another formula to the FDA. In contrast, Armour (the most popular brand of natural desiccated thyroid) has remained unchanged and safe since it was first made in the first half of the last century. Yet another advantage of this natural alternative over Synthroid is its content. Desiccated thyroid is commonly standardized by iodine content and not thyroid hormone content. This is because it contains other sources of iodine besides T3 and T4. Therefore, while it supplies the thyroid hormones that are under-produced in the body, it also supplies iodine to stimulate the thyroid gland to increase thyroid hormone production. Therefore, the desiccated thyroid can immediately relieve the symptoms of hypothyroidism by replenishing T3 and T4. It can as well as supply the active ingredient (iodine) required by the thyroid to natively produce its own thyroid hormones. Besides Armour Thyroid, there are other brands of natural, desiccated thyroid. The other popular brands are Nature-throid and Westhroid. In addition, iodine is another natural alternative to Synthroid. Some cases of hypothyroidism can be treated with natural sources of iodine such as iodized salt and sea vegetables such as kelp. Most of the resistance to natural desiccated thyroid is pure sentiment and the pull of financial gain from Big Pharma. Even now, after a century of successful use, there is no large, controlled clinical trial investigating the efficacy of desiccated thyroid. Most doctors simply refuse to consider desiccated thyroid as an alternative to Synthroid. The ideal way to take desiccated thyroid pills is twice daily and not once daily. The chief reason for this is to reduce variability in the amounts of T3 and T4 supplied by the pill. Since T3 has a short half-life, a once-daily dosage can reduce the efficacy of the Synthroid alternative and produce a wide variation in the levels of the thyroid hormone. Therefore, the recommendation is to cut a 90 mg pill of Armour thyroid into two and take one half 20 minutes after breakfast and the other half after dinner. Furthermore, doses should be increased until TSH level drops below 0.4. Thereafter, the levels of free T3 and T4 should be monitored until they get within the normal range. When taken appropriately, desiccated thyroid is not only safe and effective, it causes none of the variations claimed by endocrinologists. It is a cheaper and natural alternative to Synthroid, and it works for a lot more hypothyroid patients.